Zoulah is cackling with delight as she brings you this fast and easy Halloween giftie! It's a great little gift for friends, teachers, and co-workers. One of my daughters gave these to her friends at Valentine's Day filled with Hershey kisses. On a side note, Zoulah wants to wish Joni's mom, Nedra, a Happy Birthday today. She has been gone for over 20 years now and we love her and miss her. She was a huge inspiration to her daughters and sons in the kitchen. She also inspired us to love to learn and to try new things. Use a thin ribbon. 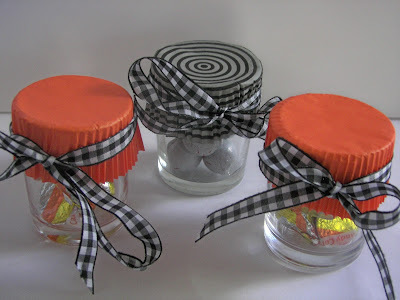 For candy, use candy with foil wrappers -- it looks pretty through the glass. You could also put in a watch, a necklace, bracelet, or a charm. 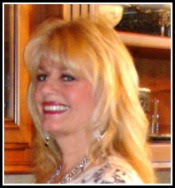 Zoulah thanks you for stopping by Red Couch Recipes from the top of her witchie hat to the bottom of her witchie toes. Joni, What a nice tribute to your Mom. I'm sure she's smiling down on all of you and is so proud. Happy Birthday to Mom! She really was a good example of trying new things. She would be so proud of us that we tried blogging!!! I made a witch shoe tonight, in purple of course with a little purple bling. That was so fun and so easy. I am going to use them as invitations to a dinner party on Friday! The Edward and Bella came from on-line. We just googled twilight pumpkin patterns. One year we had one of Pres. Hinckley. I wish I had kept that one! The pumpkins from Orlando were the foam carved ones. I loved that gate. 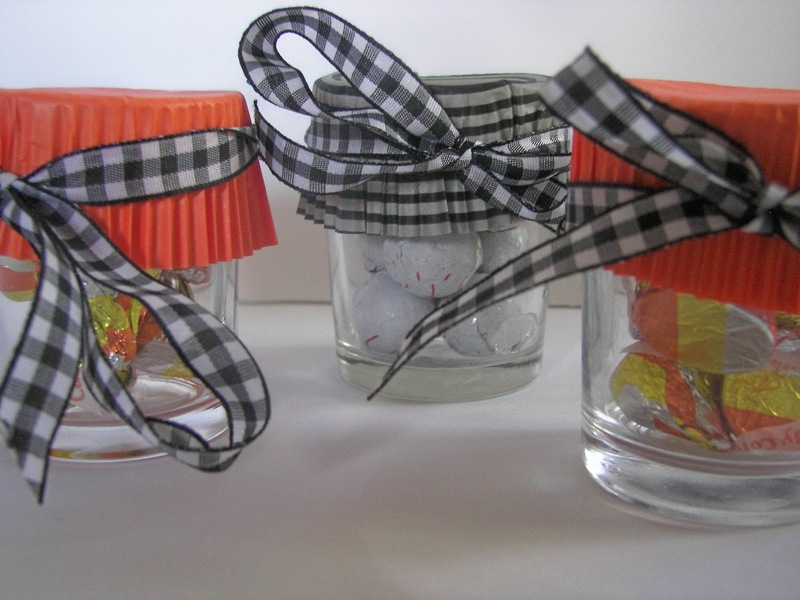 Cute, cute little gifts that would be so easy to give. So are you giving the kid's teacher's the witches shoes? Joni! I love this idea! What an adorable and festive little gift. Very creative!!!! I'm sure I'll use your idea! Very cute! I had to check it out (from Someday Crafts) because you'd written "giftie" which reminds me of my bff! I love using the cupcake liners as toppers! Very cute idea! This is just so stinkin' cute! What a clever idea to use the cupcake liners for the top -- love it! What a great idea! My sisters and I are always looking for fun/easy crafts to make. This is the winner of the day. Love it! So cute - love this post! 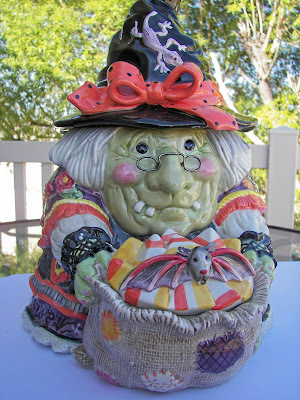 What a wonderful post :) I think it's sweet of you to mention your mom in this post :) Plus, the gift idea is really cute! I must try making it. Your mom sounds really special. I love the idea of using cupcake liners on the lids. I have some great ones from Muffin Tin Monday. This is a great idea for Christmas as well! Thanks so much!! Sweet Idea! Great tutorial and Happy Halloween! Very cute idea and great tutorial. What a sweet idea for grown-up trick or treaters! Zoulah has really rocked the kitchen this month ... you have come up with some wonderful treats and crafts and decor ... it has been fun reading all of these very festive posts! Excellent idea! I am so writing this one down for Christmas...I could do some fun things with this! beautiful ideas of gifts giving. These are fantastic! 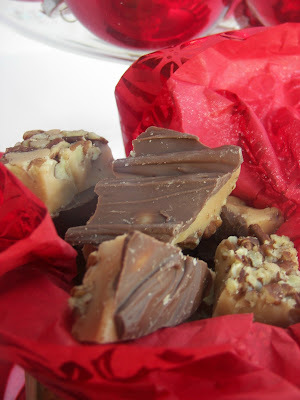 I hope you'll stop by on Sunday and share them at the Pretty Packages Party! Nice post is any case. I think I love Zoulah! These are so cute...and you could just adapat them to any holiday. 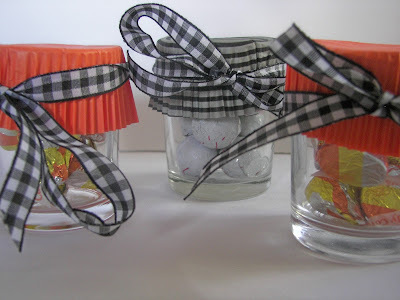 I'm going to try to find super small jars and make a version of these for Thanksgiving table favors! Thanks for a fantastic F link for our little journey through Alphabe-Thursday's letter "F". You have had a really creative Halloween season.